Physical therapists are experts in restoring and improving motion in people’s lives and can help runners improve performance, prevent injury, and get back to running. And, if an injury does occur then a physical therapist can treat it. Many physical therapists are runners themselves and subscribe to a runner’s philosophy: It’s about hard work and constant improvement. Just because you have an injury does not mean your running days are over. Whether you’re returning to running or just beginning, it’s important to ease into a routine to allow your body to adapt. Gradually increase distance to establish a base of fitness. After you have developed a base of fitness you can gradually increase your speed and pace over time. Don’t set out to win your age group in your first race. This approach will likely lead you to an injury. As you prepare for a race, listen to your body. Because your muscles are adjusting to the stresses of running, you may need to take a day or two off. It’s important to try to hit training program targets, but don’t stick so firmly to a program that you ignore warning signs and injure yourself. Increasing your weekly running distance by more than 10 percent from week to week can be unsafe. Runners in their mid-30s and older should take age into consideration when returning to running or starting a regimen for the first time. Their bodies have changed and they must make adjustments to their training routines to accommodate these changes. Take time to adjust, and build your base mileage before training for a race. Ambitious goals can sometimes make you ignore pain, which can lead to injury. On a pain scale of 1-10 (10 being worse pain), pain that exceeds 3 while running. The onset of sharp pain. A physical therapist can help determine the cause of the problem and recommend effective cross training exercises, identify when poor form may be contributing to your pain, and prescribe necessary changes in training to allow the body to repair itself. Read more about dealing with an injury on page 7. Running can clear your mind and provide stress relief. However, thinking about your form while running can help you make subtle improvements. “Listen to how you run,” Gillanders advises. “Notice how you strike the ground. Does it sound the same on both sides, or is one foot strike louder? Notice where your foot lands relative to your body. Is it in front of you, or relatively underneath you, which is often less stressful? Recognize that as you fatigue, your form is more likely to be compromised.” Usually when a runner’s form is compromised mechanical stress increases and injury can soon follow. Tip 1. 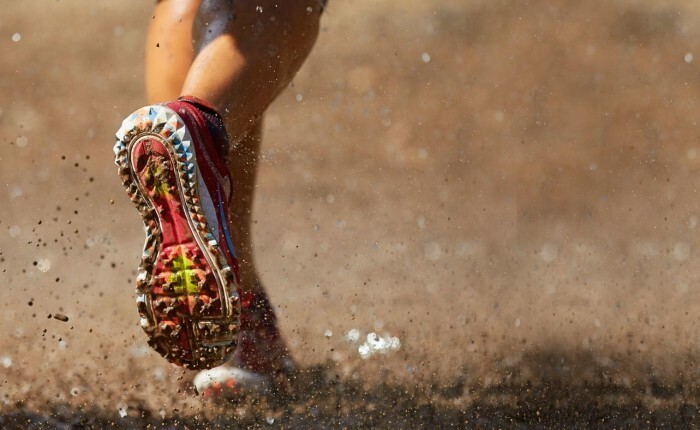 Wear your race-day shoes 1 to 2 weeks ahead of time to break them in and avoid blistering. Many runners successfully switch to lighter shoes on race day, but a shoe that changes your running style too much can result in unexpected pain. Tip 2. If you can, survey the course a day or so before the race. Identify turns and hills ahead of time. This will enable you to visualize your effort on race day, and know how to pace yourself based on the terrain. Tip 3. Dodging people and avoiding the ones who are cutting in the first mile of the race can be frustrating and a waste of energy. Be sure you’re in the proper timing gate. Tip 4. Even though you’re tapering off your training 2 to 3 weeks before the race, it’s fine to go for a 30- to 45-minute run to keep your body loose. Tip 5. Races are energizing, so many runners get out of the gate too quickly. Watch your splits to make sure your planned 7:30 pace isn’t a 6. Tip 6. Be conscious of how you are running. Hills can be especially taxing. Tip 7. Remember that protecting your body is more important than one race. Pay attention to warning signs, such as sharp or unusual pain, and signal for help if you need it. Trying to run “through” pain often leads to compensations that can strain other parts of the body. No limping allowed! Remember that if the pain is too great, it is probably better not to push it. Focus on getting better and picking another target race.